Before the days of the red Hulk, the red She-Hulk, and Skaar (Hulk's son) the battle for the strongest Hulk was between two and yet one Hulk. The Incredible Hulk #376 is, as the cover of the comic of the day suggests, the battle between the grey Hulk and the Green Hulk for dominance over the puny Bruce Banner. Inside the comic book a battle rages on, but it isn't what is on the outside that compels me towards this issue; rather, the cover of The Incredible Hulk #376 by artist Dale Keown locks me in a visual embrace much like the two Hulks embrace on the cover. Keown presents the Hulks in a way in which everyone who has heard of the Hulk would predict. They are large, smashing ruble about them, and have classic angry faces. They do not look happy. Keown worked on The Incredible Hulk from 1990 to 1993 penciling many iconic covers and imagery in the Hulk mythos. Keown then took his experience with the Hulk over to Image Comics where he created his artist owned Pitt. 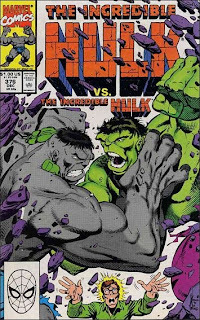 Pitt is pretty much the same physical character as the Hulk; and, though the Green Hulk eventually wins out in the old Incredible Hulk comics, by the looks of Pitt one can sense that Keown wanted the grey Hulk to win. Oh and besides the grey skin Pitt also sported a pony tail. Good choice.